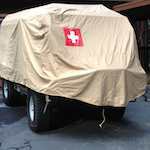 Pinzgauer Rescue - Page 2 - THE PORTAL HUB - Pinzgauers, Haflingers, Volvo 303s and more! Izzs think I sees a customer for new glass. Ha!! Funny. I was going to call you soon. I do know that the windscreen needs to be replaced. side bottom door half is rusted through due to trapped rain. the future. New rubbers and window tracks needed too. spare from you next time I'm in SoCal. up here around the clock. Just broke mid-morning, rain again Sunday. I'll be pining you soon on glass. Day 1, no rain, a little progress. Bad ignition switch now replaced with a EI replacement switch. permitting I'll start digging into the Engine. Tool and Battery box had one heck of an impressive mouse hotel in each. So far other than the bottom door half on the Drivers side, I have not found any significant rust. Hey I resemble that rescue remark LOL. Well it's running OK now. Amazed it ran at all. Brake boost line broken, big Vacc leak. Throttle plate on one card separated from the body, another vacc leak, accel jets plugged. the carb balancing airflow meter today. the KISS principle rather than going over the top as I had on the 710.
navigation, aux outlets, and ignition. washer reservoir -- lots of scrapped knuckles to install though. electronics in the Mic with the last power stage in a small box with an Aux speaker output. Yes, also upgraded the Speedo and added a Tach. Note the tach is 52mm, dash hole is 60mm. terminal of the LED to a 2.4K to 3K ohn resistor and the resistor to the +24V on the Fuel gauge. Navigation is a simple approach, I use GaiaGPS running on a iPad mounted on a adjustable tablet mount. locking mechanism. Expensive but not a plastic POS. Now onto some body work and painting. If it stops raining up here long enough. Thanks Ron! Lots of good ideas here.